If you’re driving through Vilnius, Lithuania and have the urge to stop for a quick cup of coffee, don’t even think about parking your beamer in the bike lane. “I’ve had enough of these drivers parking their luxury cars on bike lanes and pedestrian crossings,” he growled. 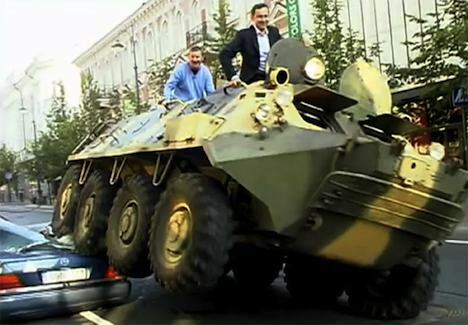 And then he rode an armored personnel carrier right on over a Mercedes Benz. Well, some people will just never learn otherwise. The video is a spoof, but still the Mayor’s humorous, and perhaps extreme way of bringing awareness to the importance of respecting cyclists throughout the city. The video spoof was shot over the weekend for a Swedish TV series, 99 Things You Should Do Before You Die. Mayor Zuokas is an avid cyclist and has created various bike lanes on streets and encouraged city residents to start cycling during his time as mayor. Bike lanes have been shown to be hazardous in some major cities, with trash cans, sewer sludge, and apparently cars blocking the way of cyclists who just want to get around without risking their lives. Are you a cyclist? Do you experience difficulty with bike lanes or getting around in your city?